It’s been three weeks since the long-awaited Kingdom Hearts 3 game has released! I have not yet been able to play it, but I am DYING to. 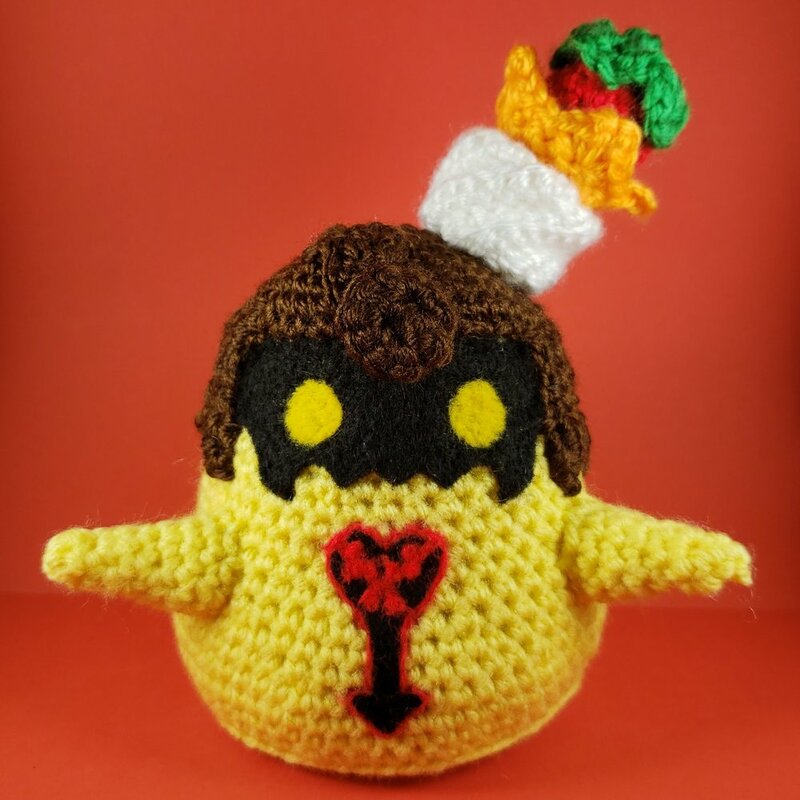 To tide me over I wanted to create some of the newer heartless from the game and finally settled on the ADORABLE Flan heartless. For now I bring to you the Strawberry version and later I’ll make the other 6 fruits and add them so you can choose and create your favorite! Close up the top & weave in the end! Working back into the round: 1sc, ch10, work into ch: 2hdc in second ch from hook, 2slst, 6sc, slst into round. Working in the round: 4sc, ch6, work into ch: 2hdc in second ch from hook, slst, 3sc, slst into round. 2sc, ch4, work into ch: 2hdc in second ch from hook, slst, sc, 3sc up the side of the rows you made previously, slst into round. Cut yarn, leave a tail for sewing. When complete this should look like a parallelogram. Leave a long tail for sewing. Double whipstitch Row 1 to Row 12 to create tube. And then weave the ends closed on both sides and squish to flatten. This is a technique learned from the incredibly wonderful and talented TwinkieChan. You can see an example & video of how she finishes it here if you need to see how it’s constructed. Cut yarn, leave a tail to sew ends together to make a hoop! Cut yarn and close up end. If you plan to sew your fruit into the crown, leave a long tail (I left mine lose so I can interchange fruit). Cut yarn, leave tail for sewing. Sew to top of Strawberry. Cut yarn, leave tail for sewing, sew the center of top of strawberry leaves. I’ve created some templates for you to use so you can cut your felt to size. Depending on the size your flan turns out to be (which is dependent on type of yarn and tension) you can size these up or down to your liking. For my Flan which is 4” and 3.5” wide (base) these felt pieces ended up being the following dimensions for me: Mask: 1.5” Tall x 3.124” Wide; Eyes: .5”; Logo: 1.75” Tall x 1” Wide. You can use red felt for the details or outline with yarn. I used yarn since I was out of red felt. Attach mask and eyes with glue, embroidery or needle felting. Sew hair to top of head. Sew arms to the sides of the body (towards the front), sew the swirl on top of hair to dangle in between eyes (so it hangs from left to right). Sew whipped cream on the side top of the head. Sew crown on top of whipped cream, place strawberry in crown (sew strawberry into crown if desired). I placed right side down simply to get the right swirl direction. 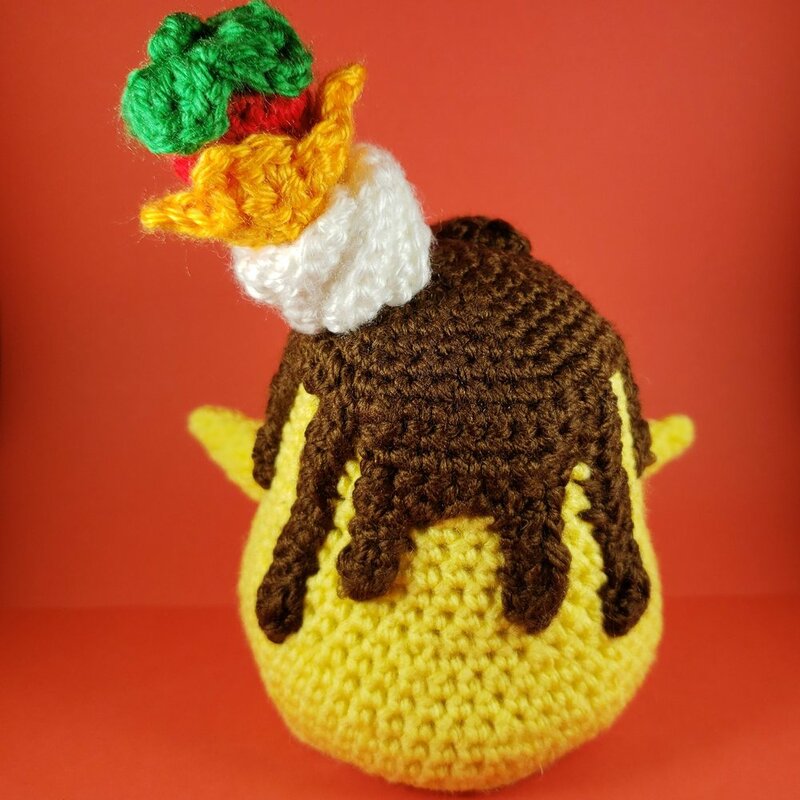 PLEASE NOTE: If you choose to sell your creations, I’d appreciate credit and a link back in your shop/item descriptions and I’d LOVE to see your creations so please tag #enchanthread in your social media posts if you post your finished creations! If you run into any issues creating this or have any questions, please feel free to leave a comment! I’m happy to demonstrate and walk through any parts on my LIVE streams. 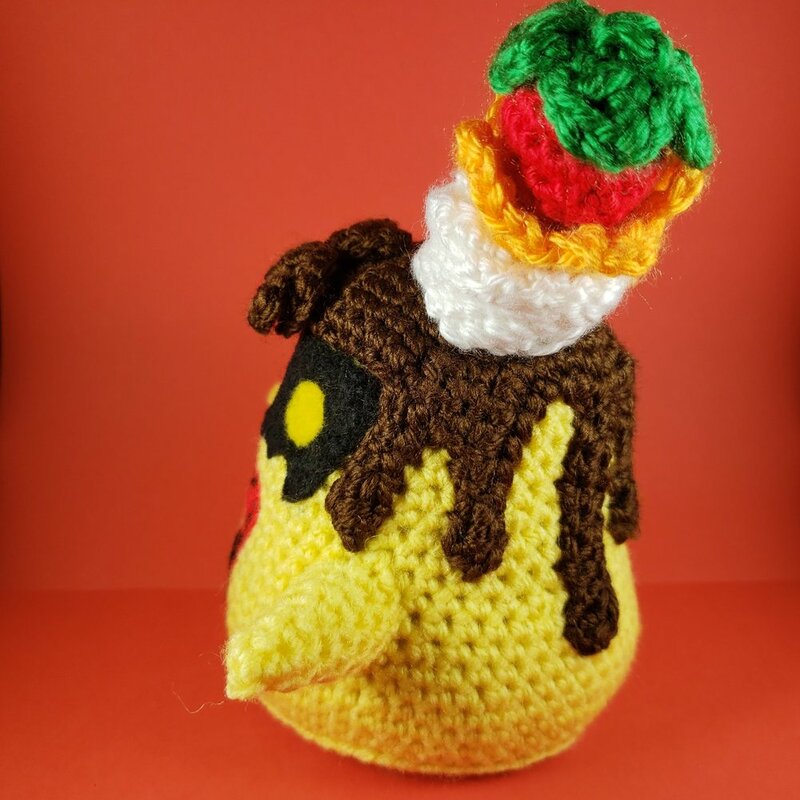 I live stream crochet 3 Days a week over on Twitch!